Last week, new mothers and babies in Mississippi won an important victory. 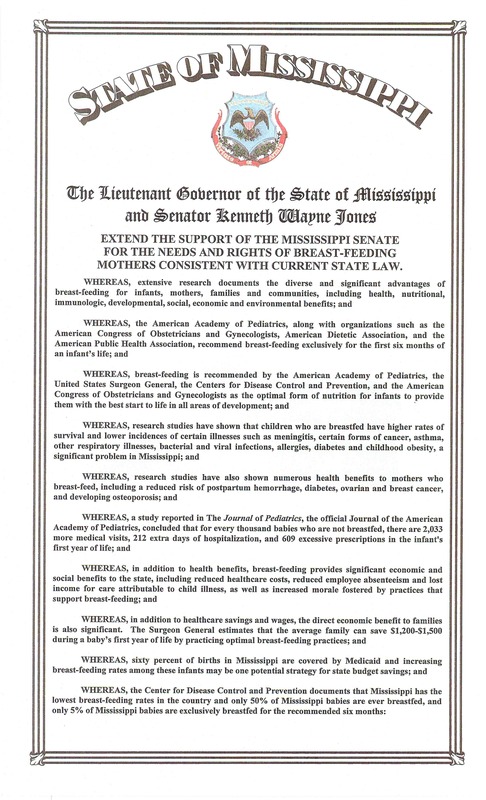 On August 7th, the Mississippi Lieutenant Governor Tate Reeves signed into law a resolution introduced by Senator Kenneth Wayne Jones to support breastfeeding mothers in the state. Breastfeeding is an important tool in Mississippi’s fight for public health. Scientific research has linked breastfeeding to lower incidences of childhood obesity, diabetes, breast cancer, ovarian cancer and sudden infant death syndrome (SIDS), as well as increased rates of parental attachment and higher intelligence rates. Additionally, in a resource poor state like Mississippi, breastfeeding is a healthy, sustainable, organic, free resource for Mississippi’s infants. Despite all of these benefits, Mississippi has the lowest breastfeeding rates in the country. 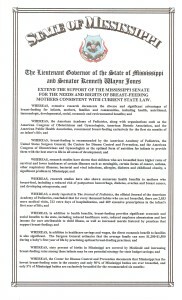 Drafted by Desta Reff, the Harvard Delta Clinical Fellow*, the resolution recognizes and expounds upon the benefits of breastfeeding and calls upon hospitals, employers, and citizens to do more to support and promote breastfeeding in Mississippi. *The Harvard Delta Clinical Fellow is a joint Harvard Law School/Mississippi State University fellowship and works in close collaboration with CHLPI’s Food Law and Policy Clinic. Why Breastfeeding is Important, Off. on Women’s Health, U.S. Dep’t of Health and Human Servs. (July 21, 2014), http://www.womenshealth.gov/breastfeeding/breastfeeding-benefits.php. Nat’l Ctr. for Chronic Disease Prevention & Health Promotion, U.S. Ctrs. for Disease Control and Prevention, Breastfeeding Report Card United States 4 (July 2013), available at http://www.cdc.gov/breastfeeding/pdf/2013breastfeedingreportcard.pdf.